DO NOT USE A MOVING BROKER! This advice is spread across the internet and for most people, it’s good advice. Far too often move horror stories involve a moving broker. But simply declaring, DO NOT USE A BROKER, isn’t really that helpful. Some of the largest, most reputable van lines in the country are also licensed moving brokers. Quick answer: avoid companies that are only licensed to broker moves. Generally, we see a lot of issues with companies that only broker moves. Companies licensed as both carrier and broker should be evaluated just like any regular moving company. In this post, we’ll lay out how to avoid shady moving brokers. But first, let’s understand what a moving broker actually is. Moving brokers are middlemen who book your move and then hire a 3rd party moving company to perform the move. Moving brokers are not the actual moving company. A moving broker is only responsible for booking the move. Once the move is booked, the broker will find a moving company who will do the actual move. Responsibility for the move will fall solely on the moving company the broker hires. If the broker made a mistake on the estimate it’s up to the moving company to correct the estimate and renegotiate the price if necessary. Good moving brokers will work closely with the moving company to make sure estimates and fees are consistent from broker to mover. However, many moving brokers take this lack of accountability as a free license to book moves however they please. Brokers will often rush to book the sale and omit critical details from the estimate. In the worst cases, the broker will purposefully leave details off the estimate so they can quote a lower price. This typically leads to price increases on moving day. Here’s an example from a 2011 senate investigation on moving brokers where a customer’s price increased by nearly 50% during her move. Why use a moving broker? Good moving brokers have the following benefits. Offer lower pricing: the broker will solicit bids from various moving companies and can find or negotiate the best deals. Less likely to cancel a move: if a truck breaks down or there is a delay, the broker can tap into the truck capacity of their network and find a mover last minute. Negotiate on your behalf: if something goes wrong, brokers can threaten to stop sending jobs to the moving company giving them leverage on the mover. Service more rural/remote areas: since moving brokers have access to a lot of truck capacity they can find trucks headed through less trafficked regions and get remote moves covered. However, most of these benefits end up being the exact opposite with dishonest moving brokers. Let’s look at how these “advantages” typically play out with shady moving brokers. Offer lower pricing: the broker frequently prices the move too low forcing the moving company to increase the cost on moving day. Less likely to cancel a move: moving companies have very little allegiance to low-quality moving brokers and will regularly cancel moves if a better job comes along. Negotiate on your behalf: if something goes wrong the moving company will blame the broker and the broker will blame the mover and ultimately no one will take responsibility for issues. Service more rural/remote areas: this one is actually true and many moving companies will only work with shady moving brokers if they have an empty truck they can’t fill. This is why it’s critical to avoid bad moving brokers at all costs. You can use the FMCSA’s SAFER mover database to quickly check if a company is a broker. If the company is a licensed broker, they’ll be assigned a Department of Transportation Number (DOT#) and a Motor Carrier Number (MC#). You’ll need to obtain one of these numbers. Companies will typically provide their DOT# or MC# on the estimate paperwork. They may also be listed on their website (check the footer) or on their “About Us” or “Contact Us” pages. Head over to the FMCSA’s SAFER mover database and plug in one of these numbers. You’ll want to pay attention to the Entity Type: and Operating Status: listed in the database. Hint: HHG is short for Household Goods. Now, a pure moving broker should look like this. This means they own no trucks and only broker moves. Pure moving brokers typically have flashy websites and high-quality salespeople. They’re excellent at selling you the move. You want to avoid these companies! These companies are notorious for low-quality standards and shady sales tactics. Lastly, companies that are both moving companies and brokers will look like this. If a company has both licenses you’ll want to ask them if your move will be brokered. 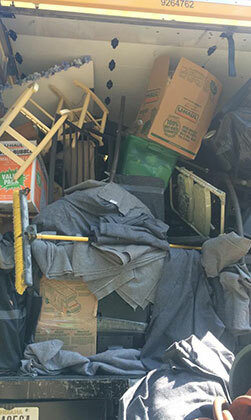 If the move is going to be brokered always ask to get the actual moving companies name who will be performing the move. Always demand an in-home or video based estimate. Phone-based, verbal estimates are notoriously inaccurate and a telltale sign of a shady moving broker. Bottom line: avoid companies that are only licensed to broker moves. Companies with a license to broker a move and a license to perform moves should be evaluated just like any regular moving company. Have any further tips, let us know in the comments!